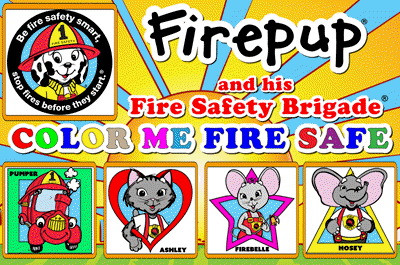 National FirePup Day could also be called Fire Protection Learning and Awareness Day, but FirePup Day is much catchier. 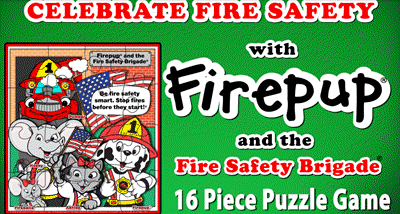 October 1st is the birthday for FirePup, the NFSC dalmation cartoon character. Fire departments across the U.S. provide NFSC fire safety educational materials and programs free of charge to the citizens of their community. If your local fire department doesn’t currently provide our materials then please encourage them to visit NFSC.org and contact us to learn how they can partner with National Fire Safety Council. Along with a section just 4Kids, there are many teaching and learning materials available on the NFSCfire.org site. 4Kids allows a child to directly put a 16 piece puzzle together online or participate in a coloring game. There are also downloadable coloring book templates. You can contact your local fire department and ask if they are part of the NFSC program to get access to the materials. Materials are free of charge to participating fire departments and the NFSC does all of the coordinating of program materials for the fire department. FCVC is very happy to support the education of children using character pets that they can be familiar with. This presents a great opportunity to learn new information in a non-threatening way. Articles that you may also be interested in for educating children Dogs and Cats Are Amazing and Deaf Dogs May Amaze You.